Two stoppage-time goals from substitutes Adam Stansfield and Richard Logan secured all three points in a well-deserved win for the visitors. Exeter went in at the break with a one-goal lead courtesy of Ryan Harley's curled free-kick on 39 minutes. Michael Rose's free-kick made the score level with nine minutes to go, but Exeter were to have the final say. Stansfield drove home from 15 yards before Logan scored from close range to round off the victory. "It was a tough game in awful conditions and in the first-half I thought we were exceptional in the conditions. "We've had our fair share of late goals against us, so it was nice to do it the other way around." 90:00+4:50 The final whistle is blown by the referee. 90:00+3:35 Adam Stansfield provided the assist for the goal. 90:00+3:35 GOAL - Richard Logan:Stockport 1 - 3 Exeter Richard Logan finds the back of the net with a goal from close range to the top right corner of the goal. Stockport 1-3 Exeter. 90:00+0:05 The assist for the goal came from Ryan Harley. 90:00+0:05 GOAL - Adam Stansfield:Stockport 1 - 2 Exeter Adam Stansfield fires in a goal from deep inside the penalty box to the bottom right corner of the goal. Stockport 1-2 Exeter. 88:46 Unfair challenge on Peter Thompson by Troy Archibald-Henville results in a free kick. Christian Ribeiro restarts play with the free kick. 86:36 The ball is delivered by Danny Pilkington, Steve Tully gets a block in. Inswinging corner taken from the left by-line by Carl Baker, Troy Archibald-Henville makes a clearance. Centre by Johnny Mullins, Close range header by Michael Raynes goes over the crossbar. 84:42 Substitution Richard Logan joins the action as a substitute, replacing Marcus Stewart. 82:26 Paul Turnbull gives away a free kick for an unfair challenge on Scott Golbourne. Free kick crossed right-footed by Alex Russell, Johnny Mullins manages to make a clearance. 80:53 GOAL - Michael Rose:Stockport 1 - 1 Exeter Michael Rose grabs a goal direct from the free kick from just outside the area to the top right corner of the goal. Stockport 1-1 Exeter. 79:48 Booking The referee shows Bertrand Cozic a yellow card for unsporting behaviour. 79:41 Danny Pilkington fouled by Bertrand Cozic, the ref awards a free kick. Correction - 75:30 Substitution Troy Archibald-Henville replaces Stuart Fleetwood. 75:30 Substitution Troy Archibald-Henville replaces Stuart Fleetwood. 72:33 Greg Tansey takes a shot. Save by Andy Marriott. 71:27 Effort from a long way out by Carl Baker goes wide right of the target. 70:38 Substitution Adam Griffin leaves the field to be replaced by Danny Pilkington. 68:27 Substitution (Exeter) makes a substitution, with Adam Stansfield coming on for Barry Corr. 66:50 The ball is delivered by Christian Ribeiro, clearance made by Steve Tully. 64:12 Christian Ribeiro delivers the ball, clearance made by Steve Tully. Corner from the left by-line taken by Carl Baker, Daniel Seaborne manages to make a clearance. 63:35 Substitution Carl Baker comes on in place of David Poole. 61:57 Greg Tansey concedes a free kick for a foul on Bertrand Cozic. Alex Russell delivers the ball from the free kick right-footed from left channel. 60:34 The ball is crossed by Steve Tully, Marcus Stewart takes a shot. Save by Owain Fon Williams. 58:01 Christian Ribeiro sends in a cross, blocked by Scott Golbourne. Corner taken by Adam Griffin from the right by-line, Ryan Harley manages to make a clearance. 57:10 A cross is delivered by Adam Griffin, save by Andy Marriott. 54:36 The ball is delivered by Paul Turnbull, save by Andy Marriott. 53:50 Ryan Harley concedes a free kick for a foul on Christian Ribeiro. Free kick taken by Owain Fon Williams. 49:28 James Vincent takes a shot. Ryan Harley makes a clearance. 47:31 Shot from deep inside the area by Stuart Fleetwood goes over the bar. 47:15 The ball is sent over by Alex Russell, clearance by Paul Turnbull. 46:49 Free kick awarded for an unfair challenge on Stuart Fleetwood by Johnny Mullins. Alex Russell restarts play with the free kick. 46:01 Barry Corr gives away a free kick for an unfair challenge on Michael Rose. Michael Rose takes the free kick. 45:00+1:51 Christian Ribeiro takes a shot. Save by Andy Marriott. 45:00+1:03 Michael Rose delivers the ball, blocked by Steve Tully. Short corner worked by Adam Griffin, The ball is crossed by Michael Rose, clearance by Daniel Seaborne. Correction - 44:59 Peter Thompson takes a shot. Save by Andy Marriott. Corner from the right by-line taken by Adam Griffin, clearance by Barry Corr. 44:59 Peter Thompson takes a shot. Save made by Andy Marriott. 41:42 Handball by Peter Thompson. Indirect free kick taken by Alex Russell. 38:31 GOAL - Ryan Harley:Stockport 0 - 1 Exeter Ryan Harley grabs a goal direct from the free kick from outside the box to the bottom left corner of the goal. 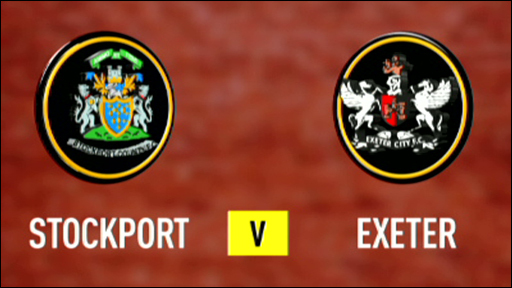 Stockport 0-1 Exeter. 37:29 Free kick awarded for an unfair challenge on Stuart Fleetwood by Michael Raynes. 35:33 Barry Corr takes a shot. Save by Owain Fon Williams. 34:41 The ball is delivered by Michael Rose, Header on goal by Peter Thompson from inside the box goes harmlessly over the target. 33:59 Stuart Fleetwood produces a right-footed shot from the edge of the box and misses to the right of the target. 32:38 Michael Rose gives away a free kick for an unfair challenge on Bertrand Cozic. Alex Russell delivers the ball from the free kick right-footed from right wing, clearance by Greg Tansey. 29:40 A cross is delivered by Scott Golbourne, Header by Barry Corr from deep inside the penalty area misses to the left of the goal. 29:12 Greg Tansey challenges Stuart Fleetwood unfairly and gives away a free kick. Alex Russell restarts play with the free kick. 28:57 The ball is crossed by Adam Griffin, save by Andy Marriott. 28:28 Inswinging corner taken by Adam Griffin, clearance made by Barry Corr. 27:47 Barry Corr is caught offside. Owain Fon Williams restarts play with the free kick. 24:48 Unfair challenge on Barry Corr by Greg Tansey results in a free kick. Direct free kick taken by Alex Russell. 23:16 Ryan Harley produces a right-footed shot from long distance which goes wide right of the goal. 21:37 Marcus Stewart is adjudged to have handled the ball. Indirect free kick taken by Owain Fon Williams. 20:10 The referee penalises Michael Rose for handball. Free kick taken by Scott Golbourne. 17:20 Adam Griffin takes a shot. Save by Andy Marriott. 12:09 Steve Tully delivers the ball, Paul Turnbull gets a block in. Corner taken by Scott Golbourne, Christian Ribeiro makes a clearance. Outswinging corner taken left-footed by Scott Golbourne from the left by-line to the near post, Unfair challenge on Michael Raynes by Matthew Taylor results in a free kick. Owain Fon Williams takes the direct free kick. 9:28 Adam Griffin produces a cross, Scott Golbourne manages to make a clearance. Corner taken left-footed by Adam Griffin from the right by-line, Andy Marriott makes a save. 8:58 A cross is delivered by Marcus Stewart, clearance made by Michael Raynes. 8:20 Unfair challenge on Andy Marriott by Peter Thompson results in a free kick. Indirect free kick taken by Andy Marriott. 7:10 Long range effort by Barry Corr goes wide right of the net. 4:02 Barry Corr is adjudged to have handled the ball. Michael Rose restarts play with the free kick. 2:46 The ball is delivered by Christian Ribeiro, Alex Russell makes a clearance. 0:59 Barry Corr takes a shot. Save made by Owain Fon Williams. 0:36 Barry Corr fouled by Michael Rose, the ref awards a free kick. Free kick taken by Alex Russell.